During the hit PBS show “Downton Abbey” millions of television viewers enjoyed brilliant commercials for Viking Cruises. I recognized – from previous European trips – many of the buildings showcased in the ad. And recently, I had the opportunity to get up close and personal with the real deal. Viking was founded in 1997 with four ships sailing primarily in Russian waters. By 2011 the number of Viking vessels was 20, and the company had 1,000 employees. This year, with 64 ships, the firm boasts 3,600 employees and a brand new 930-passenger ocean vessel that garnered awards in its first year. Recently, I enjoyed a week’s river cruise aboard the Viking Eir, a one-year-old vessel named after the Goddess of Healing among the Valkyries. And I have to tell you, those commercials are pretty darn accurate. 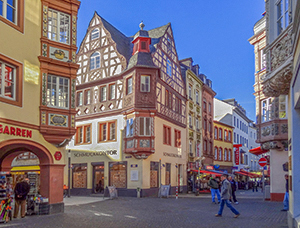 Sailing the Rhine Getaway itinerary, I flew from South Florida to Amsterdam where I boarded the beautiful longboat for a week’s sailing into Germany and France. When the cruise terminated I flew home from Basel, Switzerland. Overall, it was a wonderful itinerary. 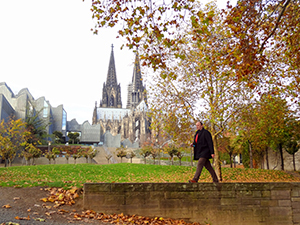 It called for a first-day docking in Dordrecht in the Netherlands, cruising the Rivers Waal and Merwede, with stops in Cologne and Koblenz, and cruising the Middle Rhine for some outstanding river views. We continued to Rudesheim, Speyer, and Heidelberg, Germany; Strasbourg, France; Breisach, Germany, and finally, Basel. 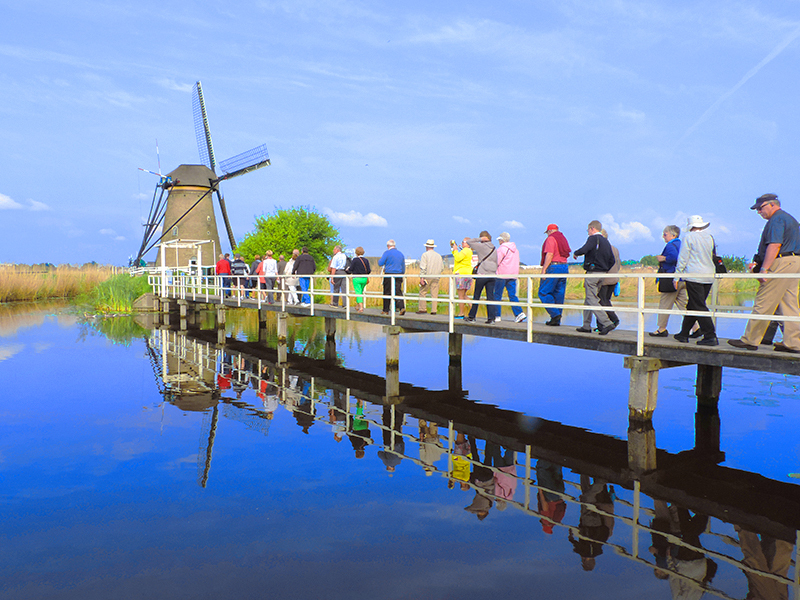 Highlighting that first call at Dordrecht was a visit to the UNESCO National Heritage Site of the famed windmills of Kinderdijk, which date back to the mid-18th century. Also, there I was able to take an optional tour to a family cheese-making farm with hundreds of gorgeous Holstein Friesian cows and its own cheese shop. A river cruise is a different type of cruising. Rolling on these rivers features storybook towns, historic castle ruins, wine country and oh, the history these waters flowed though. Kinderdijk, (“children’s dyke,”) for example, dates back to 1421. The ship itself houses beautiful surroundings in wonderful pale neutral colors and the use of varied materials from woods to marbles and rich upholstery. Low-key entertainment can range from a couple of accomplished members of a symphonic orchestra to a lecture on the New Germany. We also enjoyed a “name that tune” game, which helped provide that wonderful old bromide: Something for everyone. River cruise vessels are not large. In fact, the total number of guests is less than 200, and cabins on three levels, run small, although well put together in a Euro-modern design. Don’t expect rococo or baroque touches, think Caribbean with a Scandinavian accent. Also, the top deck, a sun deck, is broad and provides an ideal viewing point of the river during good weather. Because of the size of the ships, the ships can dock, have guests disembark and board motor coaches within a short amount of time, allowing maximum sightseeing time. In each port, Viking offers a complimentary shore excursion. Often a less-strenuous version is offered to those who may have mobility problems. Optional excursions include many longer tours, including day-long outings. 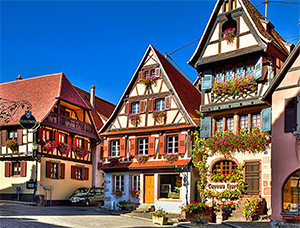 Consider “Taste the Best of Alsace,” which involves tasting many Strasbourg delicacies and French and Alsace wines. The tour includes a visit to the Gothic Strasbourg Cathedral with its amazing astronomical clock. Of course, free time is included. Another favorite is the “Black Forest Hike and Farm Visit,” a day-long outdoors tour to an open-air museum and working farm. This was in addition to a motor coach ride through the beautiful Black Forest. Moreover, shuttle buses are regularly scheduled from where the vessel is docked to the city center. 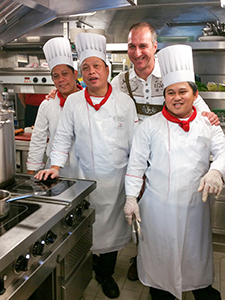 In Heidelberg, Strasbourg, and Rudesheim, the line offers an optional accompanied dinner and evening tour. By and large, the tour I enjoyed the most was a tour of the Colmar Pocket Museum and other World War II sites including the Audie Murphy Memorial. The bucolic countryside belies the horrors of the battle in winter of 1945 for the region where France and Germany meet. Cuisine on board is European, geared to U.S. tastes and each dinner includes a beef and a fish option. Incidentally, U.S. residents made up the greater number of guests on my cruise. Meals are served open seating in the sprawling restaurant on Deck Two. In addition, a lighter version of the same meal is offered in the Aquavit Terrace where dining al fresco is a treat. 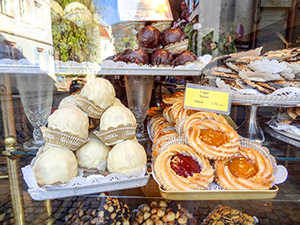 Breads and desserts are unbelievable, and fresh fruits and vegetables are always available. You can order breakfast from the menu or enjoy a buffet. Furthermore, as one would expect, beer and wine at lunch and dinner are complimentary. Of course a lot of thought has gone into these itineraries, which Viking offers throughout the world. Some of the most popular European sailings include the Danube, Budapest to Prague, Russian Rivers and a variety of offerings on French waterways. Another is the seasonal favorite, Christmas in Germany. While the European itineraries are varied, the ship’s sail wonderful Asian itineraries, as well. Consequently, you may want to consider a river cruise in Vietnam’s Mekong Delta or Viking’s Imperial Jewels of China cruise. Finally, while this was my first Viking experiences, I hope it is not my last. The line pays so much attention to detail, offering something for everyone. Furthermore, from my fellow passengers who have sailed with Viking before I learned very little is missed in projecting the culture of the river towns to guests aboard its ships. My belief is that when guests fill out their last night evaluation forms, the line reads them thoroughly.